We’ve been told or experienced when an admired, respected leader walks into a room, their presence sends a message to others about who they are and what they represent. People in the room form judgments in a matter of seconds and the impressions are lasting. You may know leaders whose presence, this intangible feature, differentiates them from other high-performing leaders. Your experience or intuition about certain leaders is confirmed by research1 that tells us that a leader’s presence accounts for 26% of what it takes to get the next promotion. Evidence confirms what many of us believe, a strong presence can expand the potential of every leader. Having leadership presence is not an exclusive talent and creating it is a lot more practical and natural then you might think. Increasing the power of your leadership presence is easily within your reach, it’s just a matter of alignment. Your leadership presence can have a major impact on your career as a leader. But, what exactly constitutes leadership presence? The conventional wisdom describes leadership presence as the intangible quality that makes up the difference between merit and success. Attempting to create a set of universal principles, some authors have identified certain traits as the essence of leadership presence. It is all too common to reduce the topic to image management; i.e. you have to “look” the part and “act” like a strong leader. Leadership presence viewed as veneer misses the core of the point. We believe if you are perceived as authentic and focused on using your natural talents and values to make a difference you can become respected as a leader with strong presence. Your presence as a leader will be your calling card as you navigate the growth of your career. We believe the conventional wisdom on leadership presence is just that, conventional, and will benefit from a fresh perspective that emphasizes the authenticity and natural talents of each leader. Our point of view is different, based on three principles that exploit the power of alignment. First we believe that developing a strong leadership presence begins with a leader clearly identifying the attributes of their leadership brand that are in alignment with their personal values. Clearly and carefully defining the attributes of your leadership brand will provide you a platform for behaving consistently, a hallmark of a trusted, respected leader. The second principle focuses on the importance of perception management in establishing and maintaining a leader’s presence. We believe that leaders must hold themselves accountable for ensuring there is alignment between how they are perceived by others and the leadership brand they have defined for themselves. Perception management, we believe, is an overlooked leadership competency crucial to leadership effectiveness and should become a conscious focus of leaders. Perception management means becoming accountable to the perceptions you create. How often do you prepare for interactions with others by articulating the perceptions you want to leave? Are you aware of what behaviors would best convey your leadership brand? If you hold yourself accountable to managing any “perception gaps” that may exist between how you are perceived and your authentic brand of leadership, you are much more likely to get credit for the difference you make, establishing a presence that represents your potential as a leader. Our third principle maintains that leadership presence must be established in the context of the organizational culture within which a leader leads. A leader, after all, is the face of the organization, not a lone wolf. A leader’s value is determined by how well she/he helps the organization attain its objectives in a way that’s consistent with its culture. The more alignment you find between your leadership brand and your employer’s brand, the more your leadership presence will be admired and valued. Also the more alignment between these two brands, the more you will feel your leadership is natural and authentic. To sum it up, ensuring there is alignment between the attributes that define your desired leadership presence and your personal values will support consistency in your actions. It’s also important to manage the alignment of the perceptions others have of you and your desired leadership attributes, i.e., closing the “perception gap,” ensures your authentic leadership brand is apparent to others. Finally, when your “leadership brand” is in alignment with your employer’s “brand inside” (cultural values), you will feel and act more naturally and your presence will grow more organically. Establishing a strong leadership presence is vital to maximizing your leadership potential. The good news is developing your leadership presence doesn’t require you to change who you are, but to leverage your authenticity in a way that makes a difference for others and the organization within which you lead. Unleash the Power of Your Leadership Presence is a development program that will empower you with powerful insights and personalized tools to create a leadership presence that speaks volumes about your leadership potential. Broadview’s Unleash the Power of Your Leadership Presence development program will provide leaders at all levels with new insights and personally customized tools to build a stronger leadership presence reflecting their natural, authentic brand of leadership. These proven tools, including an accurate assessment of how their leadership presence is perceived by others, will enable participants to proactively and naturally build a stronger leadership presence, expanding their leadership potential. The Unleash the Power of Your Leadership Presence development program is built on a blended-learning instructional design platform. Each participant will begin the development program e-learning tool to define his/her leadership strengths and conduct an assessment of their perceived leadership strengths. The participant’s learning is anchored by attending a 6-hour facilitator-led workshop. Following the workshop experience participants will be involved in virtual small-group sessions to share experiences and fine tune the strategies and tools developed in the workshop. This series of exercises will help individuals define their authentic qualities using the Broadview Personal Brand Platform model used and tested by 10,000’s of business professionals. The self-paced tutorial facilitates the participant through a step-by-step interactive learning process beginning with a pairwise-comparison decision model to determine their personal values. Following the determination of one’s values, each participant is guided through an interactive process to determine his/her authentic qualities. This statistically reliable, multi-rater perception survey is quick and easy to implement, and provides a customized report describing how the participant is perceived by others. Professional associates, friends, and family write their perceptions of the participant in their words, unlike the preformed check-list approach used by many assessments. The large sample of anonymous responses will provide participants with a statistically reliable set of data for each participant to objectively understand how their leadership presence is perceived by others. The foundational step in developing your authentic leadership presence is ensuring a strong alignment between your leadership brand and your personal values. In this module the participants will work in small groups to fine tune their Leadership Brand Platform that was developed during the e-learning Personal Brand Discovery Assignment. The authenticity and respect of every leader’s brand comes from its connection to the personal values and the consistency displayed in her/his everyday activities. Participants will learn the importance of displaying distinctiveness, relevance and consistency in their everyday actions in establishing their leadership presence. In the second part of this module participants will work in small groups to describe a set of common leadership situations that challenge them in maintaining a strong alignment with their personal values. Fact: 75% of others either are unclear of a leader’s authentic strengths or misperceive them. Most leaders will benefit by improving their perception management competence as a part of establishing and maintaining their leadership presence. Too many leaders take managing perceptions for granted or feel they lack much control over what others think about them. This complacency in proactively managing perceptions results in being misperceived by others and hinders building a stronger leadership presence. This may include having an unwarranted negative perception or judging the leader based upon some stereotype. Leaders who are complacent about managing how others perceive them are missing the opportunity to take advantage of the power of perception management. The generally accepted principles of perception management have been developed based upon over a century of research and study by scientists in the field of human psychology. In this module participants will gain a practical understanding of the principles of perceptions that are most relevant for those in leadership positions. The four key drivers of creating lasting, accurate perceptions. Why leaders with certain personal traits are perceived to be more trusted leaders than others. Learn how to overcome perceptions that are based upon stereotypes or past situations/actions. The purpose of this module is to understand and analyze how each leader’s presence is perceived by others. Each participant will be provided the findings of the Broadview Personal Brand Assessment report that is initiated in the e-learning activity. The report will provide the participant with a reliable, unbiased, factual understanding of how their presence is perceived by others. The Broadview Personal Brand Assessment follow-on activities include a set of analytical tools to enable each participant to analyze the data in the report and determine the overall themes that define their leadership presence in the eyes of others. The next assignment in this module is to determine the gap between the leader’s self-defined leadership brand and how they are perceived by others. Each leader will compare their perceived leadership presence with their Leadership Brand Platform to determine their Leadership Presence Perception Gap. Leaders will work in small groups to tap into the collective coaching wisdom of other leaders in their group to develop strategies to close any perception gaps that may be inhibiting the growth of their leadership presence. The more alignment there is between a leader’s brand and the organization’s brand (it’s “way”) the stronger the leader’s presence will grow. In this module the leader will be guided through a process of discovering the level of alignment between her/his leadership style and their organization’s brand. Prior to attending the workshop each leader will be provided a template to determine their employer’s organizational brand or “its way.” This information will be used in the exercises to discover the level of leadership alignment using the Broadview Power of Brand Alignment model. 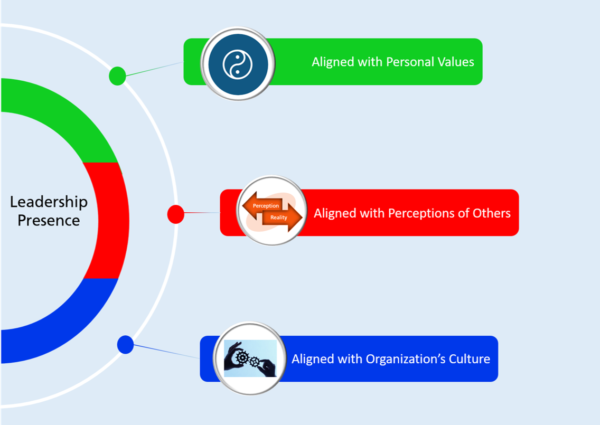 Leaders will quickly discover the alignment strength by comparing the dimensions of their authentic Personal Leadership Brand with the dimensions of their organization. How the “Way” shows up in their organization – topics of gravitas, communication, appearance, etc. Leaders will work in small groups to develop strategies to enhance their leadership presence by leveraging the alignment between their leadership brand and their employer’s organizational brand. Through the facilitation of a series of action-learning exercises leaders will begin learning how to align their actions to build a stronger leadership presence. Following the action planning exercises each leader will develop a 21-Day Leadership Presence Management Plan. Leaders of all levels completing this leadership development program will be equipped with the knowledge and personalized tools to proactively manage the perceptions that reflect their authentic leadership strengths. An understanding of the principles of leadership presence. A practical guide that defines the specific perceptions that define her/his leadership presence. A clear, fact-based understanding of the gap between how a leader perceives their leadership strengths and how they are perceived by others, i.e., their Leadership Presence Perception Gap. A 21-day action plan to enhance and consistently display his/her authentic leadership presence.